Samoa’s new Tui-Samoa Cable will span more than 1,470 km, connecting Samoa to Fiji with branching units to Wallis & Futuna and Vanua Levu, Fiji, enhancing fast, reliable and affordable internet services across the region. 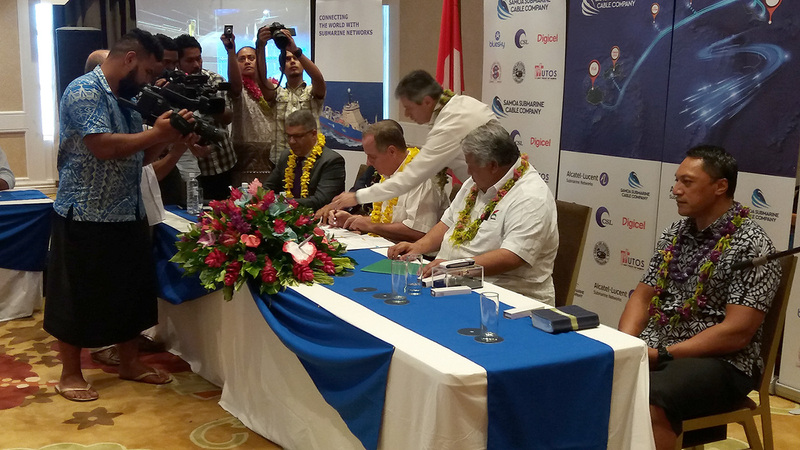 Apia, Samoa and Paris, France, 25 November 2016 – on 18 October 2016 Samoa Submarine Cable Company Limited (SSCC) and Alcatel-Lucent Submarine Networks, part of Nokia, signed a turnkey contract to roll out a new 1,470 km submarine cable system named Tui-Samoa Cable, linking Apia, Samoa, to Suva, Fiji, providing an advanced broadband highway in order to drive social and economic growth. Six weeks later the SSCC is pleased to announce the addition of the Territory of Wallis & Futuna Islands and the island of Vanua Levu (Fiji) as part of the Tui-Samoa submarine cable system. Tui-Samoa Cable will deliver up to 8 terabits-per-second (Tbit/s) capacity using 100 Gbit/s transmission technology. “Tui-Samoa Cable will help improve the lives of ordinary Samoan people; it will provide school children in rural schools the opportunity to access a whole new world of information and access online education, Businesses will be able to dramatically increase their customer base and aggressively market their goods and services online to the world and sell “Made in Samoa”, Government will also leverage the improved connectivity to speed up its eGovernment program and improve service delivery to our people. The ‘Strategy for the Development of Samoa’ (SDS) sets out government’s vison to help improve the lives of our people, and Tui-Samoa Cable is one of the key government enablers that will help us achieve that goal. SSCC equity investors and directors.